One important question that pool owners must ask themselves is how to decorate their pool deck. If you own a pool with any type of deck, it is critical that you prevent it from general abuse, erosion, and pests attack with the best pool deck paint. And it is important to choose a paint that works for your deck since the wrong product could mean a disastrous result. There is no one-advice-applies-to-all here: read the guide below to have an idea of what you should look for and your deck will be shinning within no time. Below is a review of the top deck paints on the market today. These paints will give your deck a fresh look, whether new or an old deck. This paint is ideal for repairing structurally sound, composites and wooden decks, walkways steps, porches, and concrete patios while filling cracks up and locking down splinters. It is able to rejuvenate damaged and weathered concrete and wooden surfaces saving you thousands of replacement costs. The paint also protects exterior or interior concrete and wooden surface with durable textured 100 percent acrylic durability that withstands heavy foot traffic and harsh weather conditions. And it is quite economical since a gallon of this paint covers around 120 -160 sq. ft., depending on the porosity. Another thing about the paint is that it’s easy to clean with water and soap to remove all the stains that might have attached to your deck. It doesn’t matter whether your deck is old or new, this paint will do wonders and make your deck last longer. In The Swim is a leading company when it comes to the production of swimming pool products. They also have one of the best deck paints on the market today, In The Swim Patio and Deck Paint White. This paint protects your pool deck from normal wear with a fresh and new look that will keep away all pests and cracks. And you can apply the paint to both old and new wooded or concrete decks to make them more attractive. 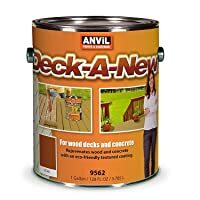 One feature of this paint is the non-skid addictive that ensures people can step on your deck without worrying about falling. For a wood application, you will require an oil-based primer to ensure that the paint becomes effective. Also, the paint is quite economical and each gallon covers about 100-125 sq. ft. So, you can save a lot of money when you use this paint to renew your pool deck. 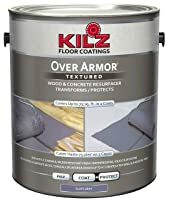 KILZ Over Armor Textured Coating is a paint that brings weathered and old concrete or wood back to life. The paint contains an advanced and long lasting 100 percent acrylic resin formula, making your pool deck look new. It is able to bridge cracks, give a uniform look, and hide imperfection on your worn out deck. Also, you can use this paint on vertical or horizontal composite and wood surfaces like boat decks, porches, railing, and decks and concrete surfaces such as patios, sidewalks, and pool decks. The paint is made to conceal cracks of up to ¼ inches and conceal splinters and form a textured slip-resistant surface. One gallon of this paint covers around 75 sq. ft. of your deck and it resists dirt. Hence, you get an easy time cleaning your deck if you apply this paint. And you might require 2 coats to get the best result when you use the paint. 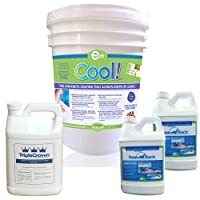 This is one of the best pool deck paint that you can use to repair your concrete swimming pool deck. It reduces the amount of heat absorbed by your deck by around 38 percent compared to other decks painted using other types of paints. It is a water-based, environmentally friendly paint that is easy to apply. It also prevents dirt from building up on your deck, ensuring that you get an easy time when washing it. Also, you will be excited to learn that one gallon of this paint is sufficient to cover around 200 sq. ft. of your deck. The paint rejuvenates your deck and is made of acrylic sealer to prevent any scratching. Furthermore, it is an affordable product that you won’t spend a lot of money when buying it. Highly decorative – The paint should be able to decorate your deck in order to preserve your decks fresh and original look. Resistance to wear – A hard to wear paint will ensure that your deck remains durable for long. Should prevent crack and fill cracks – UV light often affects your pool deck (its structure starts to change). To prevent this, you need a paint that will prevent it from cracking and being affected by UV light. Protect your deck from microorganisms and insects – Lastly, the ideal paint should be able to protect your deck from insects and other organisms that can eat or destroy it. It should repel all these animals. 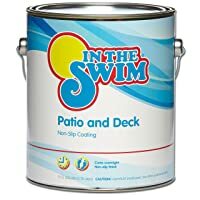 What is the best pool deck paint? The best paint should provide all the qualities I have listed above and be affordable. Q: Which brand provides the best paint for decks? A: There is no one brand that I can say it is the best when it comes to the production of pool paint deck. However, you should ensure that you buy your paint from a reputable brand and the one that has been in the business for long. It will take a lot of research before you get the best pool deck paint for your swimming pool deck. Luckily, I have provided you with a great starting point and if you have gone through this post, I know you now have an idea of what the best paint for your deck should look like. Pooldone.com is a participant in the Amazon Services LLC Associates Program, an affiliate advertising program designed to provide a means for sites to earn advertising fees by advertising and linking to Amazon.com. Amazon and the Amazon logo are trademarks of Amazon.com, Inc., or its affiliates. Additionally, Pooldone.com participates in various other affiliate programs, and we sometimes get a commission through purchases made through our links.